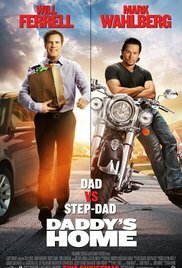 Daddy's home is about a step father and biological father competing for the affection of their two children. The duo of Will Ferrell and Mark Wahlberg make this story quite comical. Will Ferrell's character Brad Whitaker is living the life as a radio executive and has slowly been winning the love of his two step kids. But just as soon as he thought he has them, the real father, Dusty Mayron (Wahlberg) comes back into the picture. Now, both fight to be the better daddy. The two go back and forth with love, affection and gifts but what they eventually notice is, that they just need to "be there" for the kids. Aside from the bickering and feuding between Ferrell and Wahlberg, Daddy's Home was not the best comedy of the year but I had some laughs here and there. There was also an ironic twist at the end that turned things around for the two competing dads. Daddy's Home had a good story and message while being comical as well. It's not on my must-see films, so if you want to wait until the DVD or Bluray release I wouldn't blame you.